It’s National Pizza Day – although surely every day is Pizza Day…. NEVER mind Valentine’s day, it seems to be pizza that we’ve all really fallen for. A recent survey has revealed that almost half UK take-away orders are pizza. But what is it about the relatively simple discs of dough, tomato sauce and mozzarella that make us so very happy? 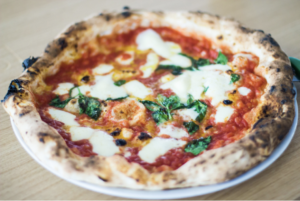 Below we’ve put together a handy guide on where to find the best pizzas in and around town. Many have won awards, some have trained with the finest pizza chefs in Naples, and all are guaranteed to give carb-fuelled satisfaction. This pizzeria, slightly hidden away in Northern Quarter, was opened last August by four young Italians – Elisa, Alberto, Paolo and Daniele. Having already carved out a reputation for hand making the city centre’s finest fresh pasta at The Pasta Factory, the four amici (Noi Quattro translates as ‘we four’) have turned their hands to Italy’s other main culinary export in a 100-cover restaurant space a short burrata throw from their original in Shudehill. “We were all missing the feel, the buzz of a true Italian pizzeria – so we thought ‘let’s just open our own’,” says Elisa.